Changing to PJP Rubber Stable Slabs and Mats will provide so many benefits, for both you and your horse. Made to our own tried and tested design our Rubber Stable Slabs and Mats will provide a simple, long lasting bedding system that is well suited to stables and other animal enclosures, and that requires minimum maintenance whilst giving many years of use. Installing our Stable Floor Slabs and Stable Wall Mats, which are so easy to clean, will save on the cost of bedding materials and reduce mucking out time and waste disposal costs. In addition the floor slabs are warm, dry and completely non-slip under foot or hoof, helping to reduce horseshoe wear and providing added comfort for your animals which can in turn aid recovery from injuries. Many horses have allergies and may be sensitive to the dust typically found in other bedding. The high-grade full bedding system available from PJP Rubber could provide the ideal solution which is why PJP Rubber Slabs and Mats are recommended by vets. 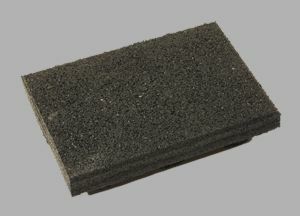 The rubber compound in PJP Rubber Slabs and Mats is from recycled vehicle tyres, so is very environmentally friendly. The slabs are 45mm (1¾") thick x 1 metre (3'3") square and priced per slab. All our Slabs and Mats have a 12 month manufacturer's product guarantee. Slab life does depend on use, but as a rough guide they should last at least five years. Some stable slabs are still being used over ten years after installation. We can manufacture to any specification you require. Tapered edges, different thicknesses, and various colours are not a problem. Please do not confuse this British made, top of the range, specially designed recycled high quality rubber product with cheaper products on the market which do not do the same job.